Many recipes call for you to sift your flour, which can be done with a special utensil called a flour sifter. Flour sifters are handy, but also a little hard to get clean. Traditional methods may not work, but before you throw your flour sifter away and buy a new one, try a few tricks to keep your flour sifter clean. 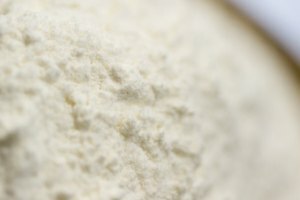 Shake off the excess flour over a trash can by holding the flour sifter in one hand and lightly banging it with the other. Store it in a plastic bag. Wash your flour sifter the best you can with dish soap and water. Allow it to sit in the dish pan that is filled with soap and water for 1 hour. Dry it the best you can with a towel and then stick it in your oven on low heat until it is completely dry. 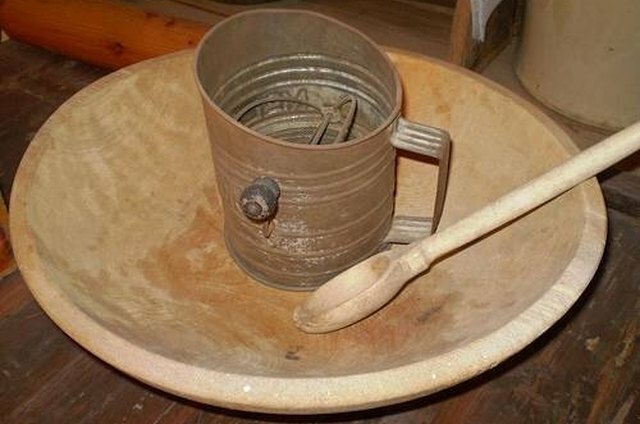 This will keep the flour sifter from rusting. Attach a hose with some bristles to your vacuum. These attachments should come with the vacuum. Turn it on and vacuum all of the flour out of the sifter. Use a toothpick or a toothbrush to get the flour out of the hard to reach places of the flour sifter. Then wash with dish soap and water and dry on low heat in your oven. Use a compressed air device. This is a device that blows air to clean your computer keyboards and other hard-to-clean places. Spray it on your flour sifter and the flour will come right off, and you don't have to worry about getting it wet and having it rust. Buy a plastic flour sifter. It can be placed in the dishwasher with the rest of your dishes. This makes for easy clean-up. Many people do not clean their sifters at all since they only use them for flour. Don't use a rusted flour sifter. It will get rust flakes in your food.